Caught up into paradise…a thorn in the flesh… My grace is sufficient. Paul’s paradise experience and the thorn given to offset it lest he be exalted above measure – from height to depth – were necessary to bring him to life’s richest experience, the daily sufficiency of Christ. We may need a crisis to precipitate the matter, bring it to a head, but trips to the third heaven and thorns in the flesh are incidental to life’s greatest lesson, to find in Christ Himself everything and draw from Him His resurrection life for body, mind, and spirit. To stop short of that is to have an immature and inadequate experience. Occasional high days, answers to prayer now and then, temporary blessings, make an uneven and spasmodic Christian life. But to live day in and out, all kinds of days, in simple dependence on Christ as the branch on the vine, constantly abiding, that is the supreme experience. Not always glamorous and exciting but always sure, it is far better than an erratic, up-and-down, paradise-and-thorn existence. “A man in Christ” – that is it! 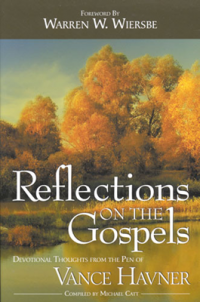 I am sure the work involved in publishing these daily devotionals is larger than most realize. Just wanted to thank you for all your efforts – I truly appreciate it. Hopefully, this will not stop, however, I understand if it is too great a burden on you.